Manila, Philippines – Celebrity Chef: East vs West – an original series created by FOX Networks Group Asia documenting a fiery culinary competition between popular Hong Kong super star Nicholas Tse and renowned celebrity chef David Rocco airs on March 25, 2018 at 9PM on FOX Life and will air every Sunday at the same time. It will be available on FOX+ on the same day with new episodes to stream weekly and from May 2018 on Nat Geo. The show will be syndicated exclusively in mainland China by FNGA partner, Tencent. The original five-part series sees these renowned chefs travel to five cities in Asia including Macau, Shunde, Manila, Ipoh and Kuala Lumpur where they spend time with celebrated local chefs learning about the city, its food and culture, and are then tasked with preparing a local dish, putting their culinary skills to the test while battling each other out. The final two episodes take place in two destinations built, owned and operated by the Sunway Group; Sunway City Kuala Lumpur and The Banjaran Hotsprings Retreat in Malaysia, which are the official premier destination partners of this series. From Malaysian cuisine to Filipino fare, there is a range of delicious dishes on display in all destinations. Representing the East is Nicholas Tse, entrepreneur with his own cooking show, also known for singing and acting. On the opposing camp representing the West is David Rocco who brings his passion for food to millions of kitchens every day through his television programmes and his bestselling cookbooks where he shares the perfect combination of food, travel and a celebration of the sweet life. The competition promises to be a memorable one, as both chefs bring not only their extensive knowledge to our screens, but also their highly captivating on-air personalities and fascinating careers and back-stories. The ultimate winner will walk away with bragging rights to culinary supremacy, and a generous donation towards a charity of his choice. On behalf of The Philippines is Chef Bruce Lim. He will challenge both David and Nicholas to try one of his specialty dishes blindfolded. Each chef must then search San Andres, a local market in Malate, Manila for the right ingredients to recreate the dish with their own spin on it. With Nicholas channeling his Asian culinary influences and David cooking with Italian and Indian flavors, there is everything to fight for in this fierce competition. The show also brings in two more local fan favorites as judges, Chef Bruce Ricketts, mastermind behind Sensei Sushi, Ooma Mecha Uma and La Chinesca and Maureen Wroblewitz, the first Filipina winner of Asia’s Next Top Model Cycle 5. 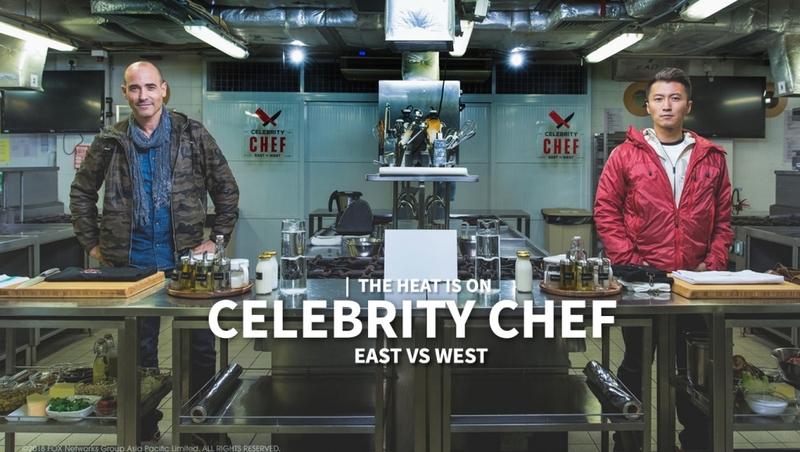 Celebrity Chef: East VS. West premieres on 25 March 2018, 9PMon FOX Life and will air every Sunday at the same time. It will be available on FOX+ on the same day with new episodes to stream weekly and from May 2018 on Nat Geo. The show will be syndicated exclusively in mainland China by FNGA partner, Tencent.